We're always looking for good recipes that use up our eggs. I found this one off the Incredible Egg website, and it was a huge hit. Not only is it easy and quick (as long as you have a food processor to do your shredding), but it's also healthy. Saute onion in oil in large nonstick skillet over medium heat until tender, 3-5 minutes. Add water and boullion; stir until boullion is dissolved. Add carrots, potatoes, zucchini and dill; mix well. Cook, covered, over medium heat until heated through, about 10 minutes. Press 6 indentations into vegetable mixture w/ back of spoon. Break and slip an egg into each indentation. Cook, covered, over medium heat until whites are completely set and yolks begin to thicken but are not hard, 8-10 minutes. 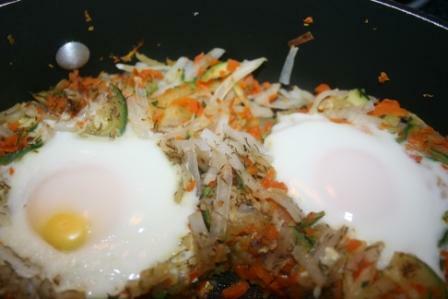 As you can see, I did overcook my eggs a tad, but with babies involved it never hurts to cook them solid. Served this with a side of turkey bacon. A fun, economical new twist to breakfast for dinner! That looks like a great idea! maybe I'll try that on Saturday morning!!! Yummy! Breakfast is served at what time? I would love to come to your house! Hee Hee, as if you need another person huh? Just being silly. After a nightmare of a night with a 17 year old sick son I need to smile. If you ever find a good Egg Drop Soup recipe let me know! lol One of my favorite soups but I haven't gotten just right yet.